This folder contains unnumbered loose pages of notes taken during interviews mostly in 1864. The pages are transcribed in the order as found in the folder. Use these links to those interviewed on this page. Mrs Devlin - Martha Wilson 64 in a few days, born in Sop??? daughter of James Wilson, who was born in Ireland, came into Canada during the Irish Rebellion, and married Mrs Sarah Roblin, widow of John Roblin, Mrs Roblin’s maiden name was Wessels. Has heard her mother talk about the Revolutionary war. She with her husband John Roblin lived in New Jersey had 2 children (Roblins forefathers were Welsh or English). Her father took no part as she knows in the war, lived at home. During the war a scouting party - or of lawless men attacked their house in scouring the neighbourhood for plunder. Roblin was sitting in the door 14 shots fired by them at the house, he was wounded in the knee, Mrs R. looking out saw her brother-in-law Stephen R. suspended by his two thumbs to a sappling by the Rebs. They were doing it to compel him to tell where money and valuables were hidden - They came to the house stripped the wounded man of all but his shirt and trowsers - leaving him breathless. The house was completely pillaged what they did not want they wasted, flour was thrown out, provisions and furniture destroyed & c. One of the men placed his bayonet & musket to Mrs R. heart and dared her to call George her King. She would not obey him; but said he was once why not now the ruffian was in the act of firing when one of his comrades struck aside the gun telling him he had made her suffer enough already. They could not find the money which was hidden. (The rebel army was near at hand) for the wounded man was soon after cared for by them. Mrs Roblin went to nurse him[.] The Doctor it seems was cruel and performed unnecessary operations in opposition to the wishes of Mrs R[oblin] - in consequence of which Roblin was lame all his life - (had no use of the joint because a tendon was cut) (Now Mrs Roblin was a most truthful woman, and Mrs D[evlin?] gave a touching account of the tribute paid to her virtue when she died, by her husband Jas Wilson after a married life of upwards of 40 years) Mrs Roblin complained to Gen Washington about the treatment they had received from his troops[.] Washington had her to search among the men to see if she could see any of the men, or anything belonging to her, and declared if he could ascertain who it was he would severely punish them. Mrs R[oblin] could find nothing. After this they as soon as could get away came to Canada by way of Oswego. Potatoes, or ground nuts, Mrs D says are good. (This must have occured before Roblins death, for in the spring when it was time to plant potatoes, they cut off the outside of the potatoe including the eye, and planted it while they eat the inside, one of Mrs Devlins half sisters in her hunger went to dig up these thick potatoe rinds and was caught by her father who seized her by the arm to punish her but the light emaciated form of the half starved girl palsied him, and he could not say a word to her. During this “scarce year[“], one of the settlers in 4th town who had a field of rye growing as soon as it was in the head, sent word to all the people to come and cut what they wanted to boil to make a milky kind of food. Fish were scarce some way could not be caught. Mrs Devlin knew Elder Ryan, and Coats and Mat Stelle [Steel? ], and his brother Daniel the latter was a railling preacher. She saw Bishop George when in from the States, at Picton ordain John Reynolds. Flauder? Smith, Benson Smith, McKenzie Smith, these Smiths were not related. Mrs D[evlin]s father Jas Wilson, was [a] member of Parliament for 22 or 24 years during this time was defeated once? or twice. First elected in 1808 or 9 was a steadfast reformer. Mrs D[evlin] knows of 4 Roblins who originally settled on the bay, John & Stephen brothers. Philip John “Crazy” Owen, and “one eyed” Owen, brother or cousins all related. Used to call Oswego, Oswaygo. Samuel Shelly Wallbridge, aged 51, born of Mass[assauga] Point. the first that they should have only for 3 years. Ketcheson having put in grain raked it in the year before, (which, perhaps he brought with him W. C.) had during the scarce year enough to eat and something to spare, and the narrator remembers living next? to his mother, although he was very young (about 3 or 3 ½ perhaps more, he was 2 yrs old in 50. and more the inhabitants lived far apart apart. W. C.) to take provisions to such as were the want of. This was some brave generally. Remembers it well because the people were so glad to get it. (Here is light Ketcheson who had been in Nova Scotia and had lost much or all of his things, and who had then come to Canada probably believing that upon himself everything depended, at least convinced that only for one year could he obtain Governmental supplies. This one just by putting in a little grain - raking it in, no doubt with one made ??? and of rough form, has, during a famine which affected a whole community enough and to spare. A covenant in itself on the inadvisabilty of Government affording supplies for a length of time, - a proof, that Government assistance is not calculated to arouse those principles of manhood and self-dependence which lie at the foundation of a peoples welfare. His father left 3rd town in 1800, and settled in Sidney in the 5th concession lot No 27. The land, 400 acres, was bought of Martin hawley, who lived on Napanee River. Paid one dollar an acre. The family moved up in batteaux, used to call them Canadian Boats, landed on the front of Sidney, where Jacob Jones’ place ---. There was then no houses in Belleville, some shanties, Simpson live in a little log shanty which had no floor. So Mrs Ketcheson says stopped there all night. Simpson had a barrel of beer in the middle of the house and he sat by it all night drinking and singing. The beer was home brewed but it was intoxicating. There were no roads then. Worked for father one year after come up, was married before this to Nancy Roblin, daughter of Elizabeth Roblin, who afterwards married John Canniff. She was born in Adolphustown in 1784. Is now in her 79th year. During this first year he had to go every Saturday afternoon to the Bay 7 ½ miles through the woods , swamps, etc sometimes no drink to be got by the way always a hard walk and carry home enough peas pork flour etc for to last 3 men for a week. These were stored there which had been brought from Adolphustown. Used to use an ox sled to travel through the woods. At Smithville in the river was a scow, built by themselves. This was the only way they had of crossing the river. Should one go to the place find that it was on the other side of the river would have to wait (or I suppose swim for it). His father when he first came up brought a span of horses. The British Government had commisarys [sic] to give out the rations during the 3 years. John(?) Carscadden was the commisary for 3rd town, Major VanAlstine for the 4th town. But Mrs Ketcheson says it was Mr Emery and that he cheated the people. Was in the war of 1812 and also did duty in the Rebellion in 37 & 8. Am shown the several commissions received. Geo Bleeker was born in Ameliasburgh oppo? [torn]] ?ruitore, in 1791. Fathers name was John, bo? [torn] in Albany. He was for some time with Capt Singleton? before his death, always engaged with in the fur trade with Indians. He was married to the 2nd child and oldest daughter of Capt Myers. Mr Bleeker gives the names of the 1st Settlers on the Front from Moira to Trent. On this side of Trenton the first lot in Sidney, not the Gore. Judge Smith settled. Had two sons Peter & John who drew the Gore owned by Doct Strachan. On the other side of Trent River the broken front was settled [by] his father John Bleecker, next by Wm Abbotts. next ?? Weller, next John McArthur, next Mathew Howell, next Thomas Calhoun. This is the last he remembered, and up to Dead Creek so called from the muddy & sluggish current. There is an exterior marsh here. On Mr Smiths old place is the English Church which was built under the care of Rev Mr Campbell of Belleville. It was never very well attended for there were but few church people among the settlers. the proper noun of the old Captain. The indians called the premises of Capt Myers where the first dam was built Cals Junk? signifying first-stoppage in the river. Zwicks island thinks always belonged to indians. Zwick bought the traded land opposite the way it came to have his name. Smiths island took its name in the same way. Also Capt Myers island. The Capt for a time paid rent to the indians for it; at last he did not. At first to grind corn they sometimes used a spring pole. That is a contrivance like the well pole. In the first place a large oak or maple log was sawed about 4 feet long; one end of this was hollowed out , deeply, by burning. The corn was put in this, not too much or it would fly out. A hard weight fastened to the pole was made to fall into this by the hands, and there the weight of the other pole would assist to raise it as water is raised by the poles out of the well. Has heard that during the scare year Mr Smith used to have persons come and work for a little to eat. Crysler bought a cow of Smith for 8 bushels of potatoes. 16 Sept 1864 Billa Flint Born 9 Feb 1805 some five miles back of Brockville. His father was born in Connecticut while it was yet a British Province. The Grandfather started to come into during the Rev War - but having “Continental” ways he had to stop so lived and died in Vermont. Came to Belleville in 1829. There were at that time about 700 inhabitants. Belleville was a sorry looking place no large buildings only two or three painted. The streets were very muddy muddy in the rainy season. There were no ditches and no sidewalks. There was no sidewalk until’06. The stone was brought from the river below the farthest dam. Grandfather threatened to prosecute them. Has heard the Indians say that the river Moira was called by them “Iagonoscokou”. The pagan Indians when starting to for the Hunting grounds up the river were accustomed to deposit in the water just below the the pier of the bridge on the east side a piece of tobacco as offereing to their God. The same offering was made on their return. Father’s name was Alexander. Born in Scotland. Came to America when a youth a short time before the Rev War broke out. Joined the British Army as a private. Became an Adjutant, was at the battle of Bennington. His company was annihilated, remained with his Colonel until he was shot through and fell from his horse. Nicholson tried to get him on the horse again, but the Col. told him it was no use, that he must look out for himself. So he ran. Jumped into a corn field, a ball struck him in the hand as he was getting over. Many were firing at him. Ran with difficulty through the cornfield came to “Casock” river, an Indian (British) on the opposite side fired at him by mistake, made sign to him, forded the river - escaped He and others were in the woods for days, scouts searching for them Friends would bring them provision for meals in the woods. Woke up in the morning and found hair frozen to the ground. Thinks he came into Canada in 1779. Was one of the first settlers on Mohawk Bay. Settled with Woodcock, Peterson, Campbell, Richardson. Cleared first year an acre and a half. Put in grain with an iron rake. Built a small log house. Had to go to Montreal for stores. His father brought the 1st horse into that settlement from Montreal. Neighbours bought cows at same time. Had to make bridges along as came to cross rivers. The horse was grey in color. Remembers well her appearance. Father married Sarah Huff near Bath. Had 13 children.Was a Presbyterian. Removed to Thurlow in 1809. Died in 1820 aged 66. His mother mother used often to stand in the door and cut bread by the loaf for the starving neighbours. Would have starved only for greens and fish. A plant called Butterrut, another Pig weed. Tells a story about Johnson and Dodge living near Belleville. Settled together, cut trees down together, cut round the tree one following the other. Dodge ran, the boughs switched his posterior department. William Anderson Sr. Aged 80 years, Resident of Ameliasburgh, Native Monahan Co, Ireland, Born 1787. Was taken by a press gang when 18 years of age and was forced into the Navy where after serving several years, he was taken prisoner by the French and was afterward exchanged for other prisoners at Boston, which was then a British Colony. He was then set at liberty as a civilian and shortly after settled at Fish Kill on the Mohawk N.Y. State. Shortly after he married and became the father of two sons Philip and John. His wife dying he married one Polly Ray by whom he had 8 children visj; William, Ruth, Neoma, Iabel? Deborah Catherine, Samuel and Garrett ( who being a strange genius was given the comical name Crawd) and Lucretia who is still living. On the breaking out of the A. Revolutionary War he left his comfortable home on the Mohawk and came to Canada, where he settled at Adolphustown a stones throw of the site of the old Court House. He drew a number of lots in different parts (as a U.E.L.) among which was one adjacent to the Lake on the Mountain in P.E. Co, although he lived on a single acre in Adolphustown. He was not long on so small a plot before two of his neighbours made him a present of two acres each giving an acre. In time the large tracts of wild lands which he drew (as a U.E.L.) in the west, were taken charge of by his sons. One of his sons became a Captain in time of the American War. The letter which I mentioned to you once, which was written by General Brock to this Capt. Brock just a few days before the General’s death, is in the keeping of one Resin, a grandson of Capt. Brock who lives in Linsay. It would be quite difficult to get it as we do not know where this Resin lives, only that we know it is somewhere near Linsay [Lindsay?]. Of this Brock family only one survives the rest having past away some time since and this survivor is my mother’s mother, Lucretia Watterberry. In time she married one Mason (my mother’s father) and lived opposite Belleville (then Meyer’s Creek) in the 4th town. (1805) Society here seems to have been in its elements, though the most of the lots in the 1st & 2nd Concessions were quite well settled. The inhabitants of 7th town seems to have been regarded by their neighbours (the 6th towners etc) as being “rough”. This I have from a number of old persons; and they were regarded as being such, until quite recently, say 1845 or /60. My father states that though he used to be invited to a number of weddings etc, when he came from the 6th town to live in the 7th town he never took any hand in their “frolicking”, but would join heartily in the 6th town “sprees”, when he could get a chance. This he attributes to a wide difference in the morals of the two places. A story is told of an incident which happened at a “bee”, which well illustrates that the “7th towners” were possessed of uncommon combative propensities.”Bees” were great institutions in those days. Every settler seems to have been licensed to make 2 or 3 each year providing he furnished a good “pot-pie” and plenty of grog and never made any objections to his “guests” fighting. The latter was liable to be commenced at any stage but was always supposed to reach its height about supper time, after work was left and while the matrons were providing supper. At this place (Old Johnny Coles, who lives 2 miles west of the ferry) the women were obliged on account of the large number of helpers to spread the board in the door yard. On this being announced by the Mistress, a little girl of the house, say of 12 summers, fearing that she was a going to miss the usual scenes, inquired of her mother, that if she set the tables in the door yard, where were the men a going to fight! Such scenes are more the exception. Getting married in those days was a “small time” with the 7th towners. The Carrying Place was the usual place of resort. They placed in a lumber waggon a number of chairs and each gallant was supposed to support his “partner” on his knee and thus economize room. Bitters was freely drank but no fighting allowed; any person trying that was put out. Keeping good natured on such occasions seems to have been a great point. No old persons went off to the wedding but they freely joined in the dance when the youngsters got back. A wedding without a “dance” was certainly an insipid affair; dancing being generally kept up two or three successive nights at different places. 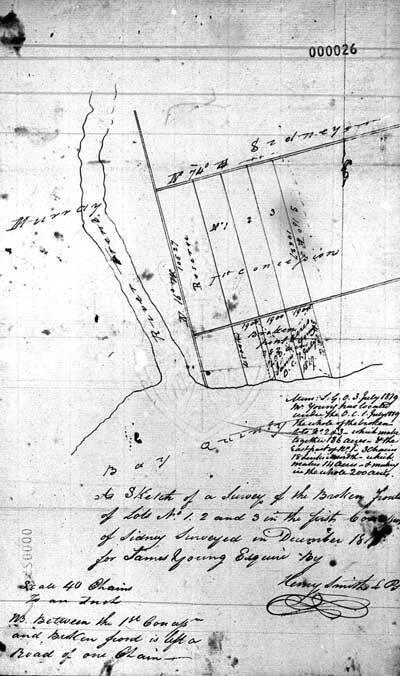 Francis Moses was a “half way house” between Rednersville (then McMan’s Corners) and the Carrying Place. He (like Capt Isaac) was a great fiddler and the wedding parties frequently stopped with him the first night. A yoke of steers, a cow, 3 or 4 sheep, with a bed, table & 2 Doty chairs was supposed to be a very decent “setting out” for the bride; and if the groom was acknowledged heir of 50 or 100 acres of land with a little cleared, he was supposed to be possessed of sufficient worldly gear to constitute “a first rate match”. There was a race course on the plains, such as at some plumb trees. In the scarce year in Lower Canada roast corn was meted out by the spoonful. They also had flour made out of Millet seed. The bread was sweetish but good. Jalin Frederick was very fond of cakes. Somebody was baking some when they were scarce. He happened along and the cakes were hid. It was thought he took? them. The old gentleman, a fine one, is not well, is not able to give me much information. Talking about Major Young, was Ensign in S J Johnson’s Regiment. On one occasion was going from the head of Picton Bay to South Bay. He was a great hunter and could follow a track, or any line. Started from a land pullar? on the east side of the Bridge at Picton, where it now is. On this occasion he went out of his way and instead of going to South Bay stumbled on East Lake. Was so pleased with it that he settled there. He had two sons Daniel & Henry. Henry died in Kingston during the war of 1812 while on duty. They all drew land and got rid of it. Young was born in the city of London, but was of Dutch parentage. In the States before Rev lived in a place called Husock, a little below Albany. He was in the battle of Bennington. Died at about 80. Was a famous hunter. Could always get a deer. Had half pay. (Wm Aylesworth raised $1000 worth of produce. Did not have much education. East lake is 15 miles long and 1 ¼ broad. Miss Clara Ripsom of the 4th town, daughter of a UEL was possessed of more than usual beauty. She belonged to the second generation of U. Canadians. She had reached the interesting age of 15, when there came to her father’s neighbourhood a middle aged man in the Quaker garb and speaking in the mode practiced by that sect. He had a large trunk and Portmanteau of remarkable weight, and which he led to believe contained solid money. His manner as well as his boasted wealth mov[ed?] the father’s heart. Wm Penn Huntington, for that was the name he bore proposed to the father for his flowering daughter. The father having swallowed the bait, promised to obtain the consent of his daughter. After some trouble she consented. The “honest Quaker desired that no time should be lost fixing the nuptial ties, and the following sabbath the banns were published in Bath. But the fair Clara’s brother residing here came by this rucous to inquire into the character of his future brother in law. This cruel proc? resulted in the discovery that Wm P. H. was an imposter and scoundrel of the blackest kind. His portmanteau always as? heavy with supposed gold was left behind when he left his landlord, and after some [time] the landlord felt it his privilege to open the trunk and take enough to pay himself for his loss, but the portmanteau was found to contain only hard stones. Judge Fisher Judge of the Co.
Thomas Starrow Brown in the NDM? in an account of “183- and my connection with it” that he was Born in St Andrews, Province of New Brunswick. I am of a “good Tory” and not of a Revolutionary stock. My father’s father, a Boston merchant, sacrificed his all for the Royal cause, and left for Halifax with General Gage, when Boston was evacuated, in 1776. My mother’s mother emigrated from Portsmouth to New Brunswick, and with a daughter married to Captain Starrow, of the British Army, from whom my name was taken. She was a Wentworth, cousin to John Wentworth (afterwards Sir John, Governor of Nova Scotia), the last Royal Governor of New Hampshire; niece to Sir Benning his predecessor; and granddaughter to John Wentworth who preceded him. These three “Wentworths” - father, son and grandson - having governed New Hampshire for more than forty years. John Howell, Demorestville, 56, Sophiasburgh, Fathers name Griffith Howell From Dutchess Co., was born in Oswego while it was yet held by the British. Mothers name Freleigh, it is the same as Fralick, grandfather John Fralick held a commission in the British Army. Came in after the war settled in Kingston, built there the 4th house that was erected. 1812 The woods all around Kingston was cut down that might see the approach of enemy. Mr Youmans came to Belleville 50 years ago. His grandfather came from England to Massachusetts. Afterward settled in Colchester, New London County. He was at one time an officer, Capt., under George III. When the Rev. war commenced bought himself the liberty to keep neutral; paid a good deal. When came to Belleville he was opposed by Coleman because he was an American. Coleman was an Englishman direct to Canada. Had to go to Kingston and take oath of allegiance before could buy land. But it was not necessary had he known it. But few good houses in Belleville. 48 years ago put up the form of the building now occupied by the Wallbridge’s for Widow Simpson. Stood some two years. Wallbridge bought it, one part a store. It was expected that here would be the centre of the town. Tried to get a bridge across there. He was a Capt. (Probably in 1812 WC) Brother one of the 1st merchants in Kingston. Mother’s father named Purdy also a U. E. He went from home on sea board a Ship Carpenter and was killed during the war. And the family lost everything by the Rebel Army. Their stock was all driven away. Had to make their escape. There are Herchimers in the State of N. York, a Herchimer Co. Has heard mother’s brother tell of an occasion when in a Fort were short of balls and put stones in stocking and fired them. In the War of 1812 was appointed to the Flank Company, they were first called out and submitted to a thorough drill was 9 months in Kingston, was in no battles. There was no fighting at Kingston where he did all his duty. The American Fleet approached Kingston once for the purpose of destroying the Royal George the only British war vessel in the place. It was brought under the American guns of the batteries. Firing was kept up for a while. The American vessels on the Royal George[.] The batteries on the American vessels. One of the American vessels was disabled at least had to draw off. The Royal George was too far off to be injured; believes a few shots struck the vessel. The Americans finding they could not accomplish the destruction of the R[oyal] G[eorge] retired. The UE Loyalists to draw and had to show their certificate of discharge. These were sometimes lost. To meet the wants of such as well as those others entitled to draw land, a Board was appointed by Government to examine applicants claims, and grant certificates. Thinks there was a board for each town (that’s for 1st 2nd 3rd etc towns.) But perhaps one board for 2nd or 3rd towns. These certificates were called “location certificates.” Thinks that these boards may have been in existence for a year or two. These “location certificates” were often sold by the holders, perhaps several times, thinks likley the transference consisted simply in writing the name of the holder on the back of the certificate. Some confusion arose out of this, when parties presented their certificates to government to obtain the deed for their land. These certificates were often sold for little or nothing, often for a calf or a sheep or even less. him on his back for days, probably with the idea of killing him if necessary to save life. They escaped. Afterwards: the Capt was called only his General Schuyler. The joke was[,] the Capt said to the General this is the dog etc. To those present it seemed like a formal introduction of the dog to the General and the Capt was afterward rallied for it.